King Richard II, the eldest surviving son of the Edward, the Black Prince, and Joan of Kent, was born at Bordeaux. He became heir to the Crown upon his father's death, in June 1376, and, upon the death of his grandfather, Edward III, a year later, king, at the age of ten and a half years. No regular regency was established at his accession, but Parliament nominated a council and assumed a general control over it. In this council, John of Gaunt, the eldest surviving son of King Edward, had little power. In 1381, King Richard, aged only fourteen-and-a-half, showed splendid courage and craft in facing and subduing, in London, the Peasants’ Revolt, the worst insurrection of the lower classes that ever threatened society in England. In the next year, he was married to his first wife, Anne of Bohemia. His uncles, John of Gaunt, Duke of Lancaster, and Thomas, whom he created Duke of Gloucester, as well as the Earls of Warwick, Arundel, Nottingham and Derby, were "over mighty subjects," constantly dangerous to the Crown. Richard seems early to have taken refuge in the society of what these men called 'favourites', such as Michael de la Pole, Robert de Vere and several of his father's old companions in arms. Accordingly, in the Parliament of 1386, the opposition demanded a commission of 'reform', which was to govern the Kingdom for a year, and, after some long resistance, the King was obliged to give way. Such of the favourites as the opposition was able to catch were put to death in 1388. Richard professed to acquiesce, but he was only biding his time for vengeance. This did not come until in 1396. Richard had married his second wife, the child bride, Isabel of France, and concluded a long truce with the French Crown. In the next year, he contrived to arrest Gloucester and Arundel, always his secret enemies. 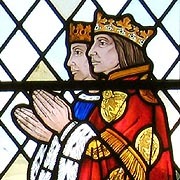 Then, overawing a parliament by the presence of a strong armed levy, he got the Acts of 1386 and 1387 repealed, condemned Arundel, Gloucester and Warwick to death, banished Archbishop Arundel, but acquitted Derby and Nottingham, whom he soon afterwards advanced to Dukedoms of Hereford and Norfolk respectively. 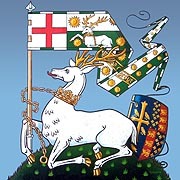 A fresh Parliament, in the next year, at Shrewsbury gave the King the customs for life and he, afterwards, interpolated, into the Act, clauses still more favourable to the Royal authority. Meanwhile, the two remaining leaders of 1387, now Dukes of Hereford and Norfolk, could not but feel uneasy. Each suspected the other of maligning him to the King. They quarrelled and challenged each other to a jousting duel. The King stopped the duel when the combatants were already in the lists, and banished them both. To Hereford, however, he expressly promised the estates of his father, John of Gaunt, if that prince should die during his son's exile. John died in 1399 and Richard violated his promise by confiscating the Lancastrian estates. Duke Henry returned from France and landed in Yorkshire, professing to claim only his father's title and property. 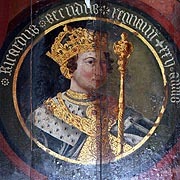 However, Richard's government had been so unpopular that Henry was eventually able to go on to claim the Crown itself. Richard was in Ireland when Henry landed, and Henry, though as yet acting only as Duke of Lancaster, was practically master of the kingdom before his rival's return in July 1399. They met at Flint. Richard's own army had already melted away or deserted him there and he was, at once, treated as a captive. He is said to have offered to resign the Crown there and then, but the actual resignation did not take place till he had been taken in Henry's train to London, where he was sent to the Tower. A committee nominated by a parliament, which Henry had called in Richard's name, received his resignation. Richard was confined in various places, until a rising of his friends in 1400 which, though easily put down, is supposed to have led Richard's murder by starvation at Pontefract Castle. He was thirty-three. Numerous traditions that he was alive and had escaped to Scotland or elsewhere were handed down, but none of them are capable of proof. Richard's character has been a standing puzzle to historians, for it was evidently full of self-contradictory traits. The high-spirited boy who, alone of English sovereigns before George III, was ever called upon to confront a dangerous mob, and who emerged so triumphantly from that ordeal, ended as a melancholy, perhaps an insane captive. Fierce, impulsive and affectionate at some periods of his life, he was crafty and secret at others, yet with occasional fits of dreaminess. He had evidently a very high idea of Royal prerogative and a great contempt for Parliament and for his nobles. He was able to show much interest in letters and in art, though we do not know whether he was himself at all learned. He was prudent enough to make peace with France, which no doubt added to his unpopularity, and to undertake on two occasions, though without success, the long neglected task of restoring peace to Ireland. He was a man of great stature and great personal beauty.